I had no idea what a hit these pita rolls would be. 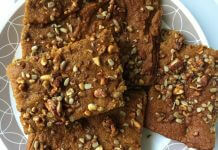 They seemed so easy to make and with such a familiar taste to them, I didn’t even think they would be very interesting to other people. 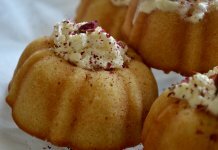 When I instagrammed making these several months ago, so many people were intrigued and wanted the recipe. I totally understand why now- they’re so so easy to make and don’t take too many ingredients to put them together. For people who don’t like tabbouleh or hummus (if they exist), you don’t even really have to put them in the rolls, but they definitely taste better with the two, in my opinion. 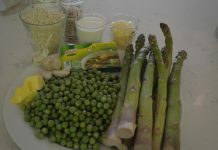 Start with the best quality ingredients you can find, as with all recipes. The same goes for olive oil and vinegar (i.e. date vinegar or apple cider vinegar). Don’t skimp on the good stuff if you can afford it. 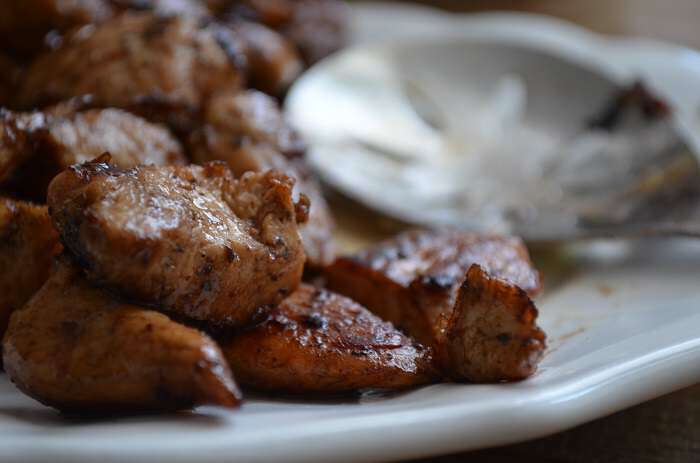 There truly is no replacement for real olive oil and the flavor you get with a dark vinegar like date vinegar is unique so if you choose to de-glaze this dish with another type of vinegar (i.e white), it will vary a bit. 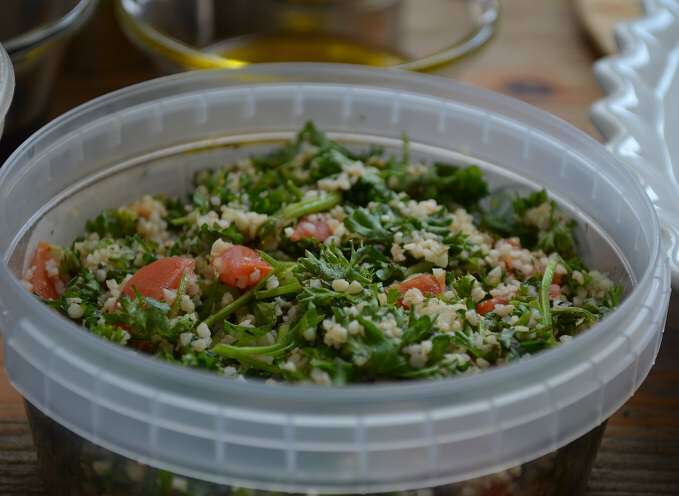 Get a good quality tabbouleh or make it yourself, of course! 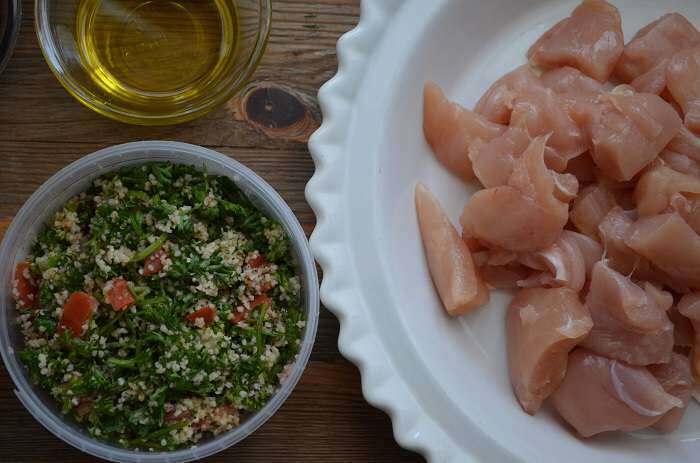 Here’s a link to my Tabbouleh recipe if you decide to spend a lot of time chopping. It’s quite therapeutic, really. 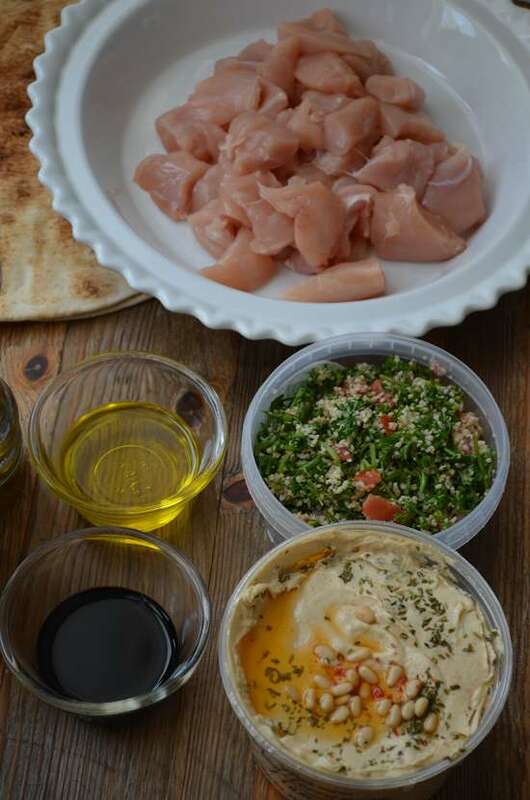 A few more ingredients include hummus (here’s my recipe for creamy hummus), 4 pieces of large pita bread, and of course, high quality dhabiha halal chicken, which you can get from Crescent Foods. 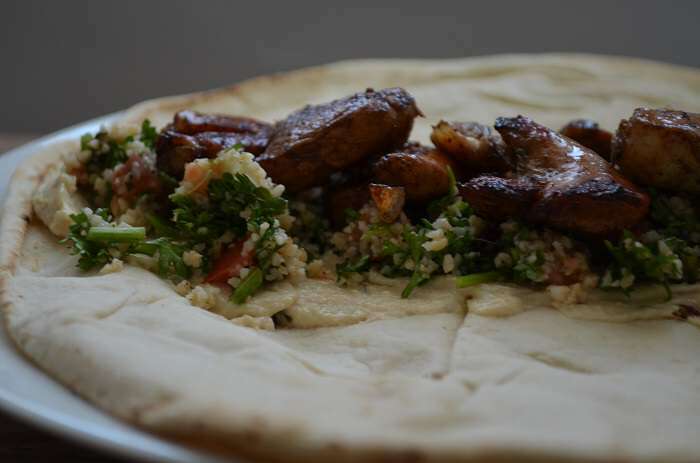 The perfect cut for these pita rolls are Crescent’s new boneless skinless breast cubes. How much easier could it be? 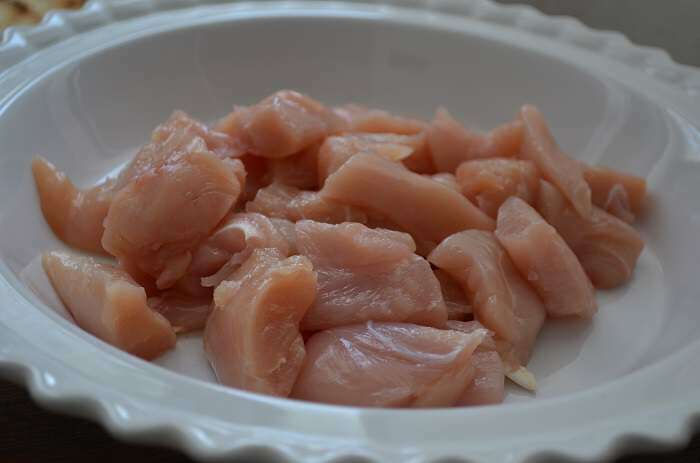 If you absolutely can’t find the boneless cubes, you can also just get their boneless skinless breast tenders and cut them up, which takes all about 2 minutes for a pound of meat. 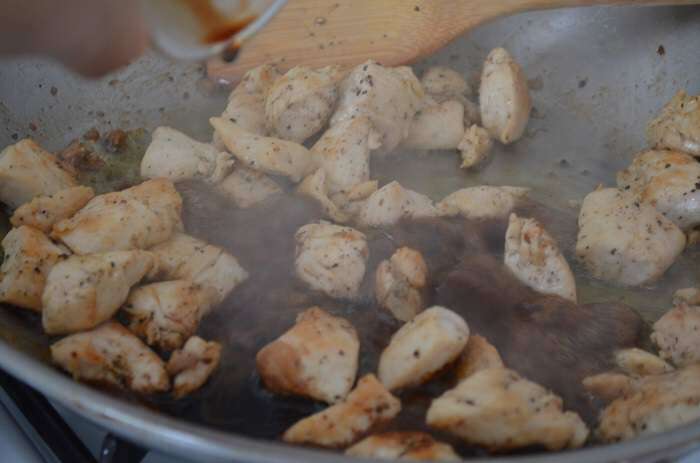 Start with a large saute pan and add salt if you’re using a non-stick or a non-cast iron pan. 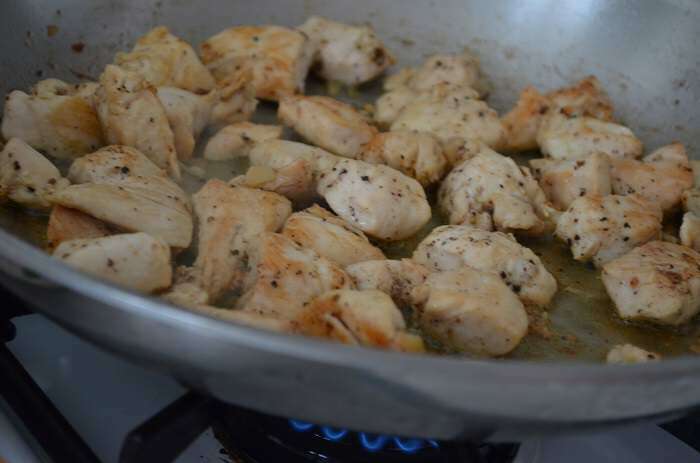 This helps prevent the chicken from sticking to the pan during cooking, which often happens with skinless meats. Add just enough for the recipe to avoid over-salting. Add the oil to pan now gently heat. 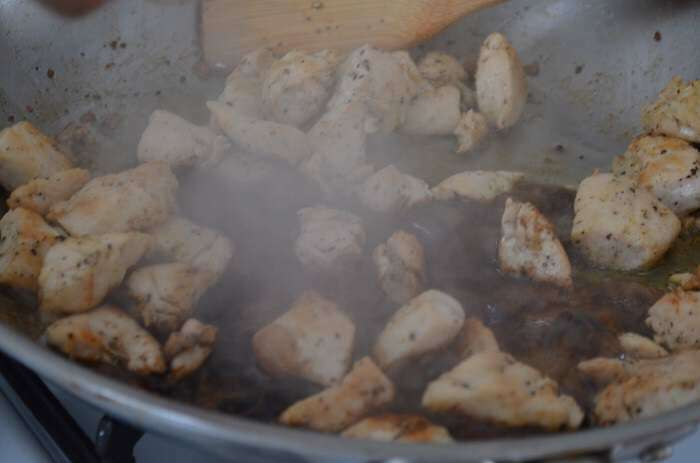 When the oil is hot (not burning), add the chicken, freshly ground pepper and any additional salt you think. Cook over medium high heat. Let the chicken brown on one side then flip. Flip again until they’re really nicely browned on all sides. 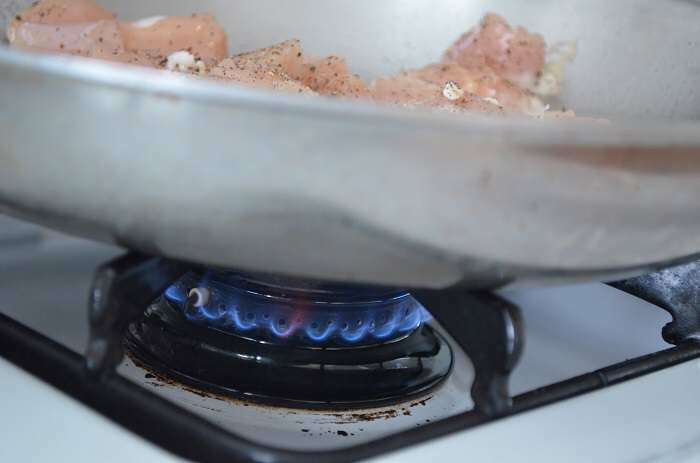 You may need to stay right in front of the pan to do this, in order to avoid burning or pulling apart of any meat. All at once. It will start to steam and evaporate just as soon as it hits the pan. 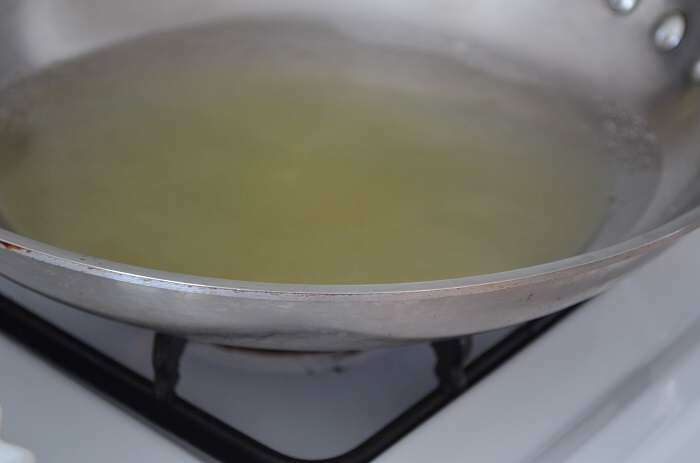 Stay right in front of the pan to deglaze the oil and any scraps at the bottom of the pan with your spoon or spatula. Keep doing this until all of the vinegar is ‘gone’- it’s really attaching itself to the meat. It should look this beautiful by then, the deep dark color is due to the vinegar. Don’t worry if there’s a little oil left in the pan. 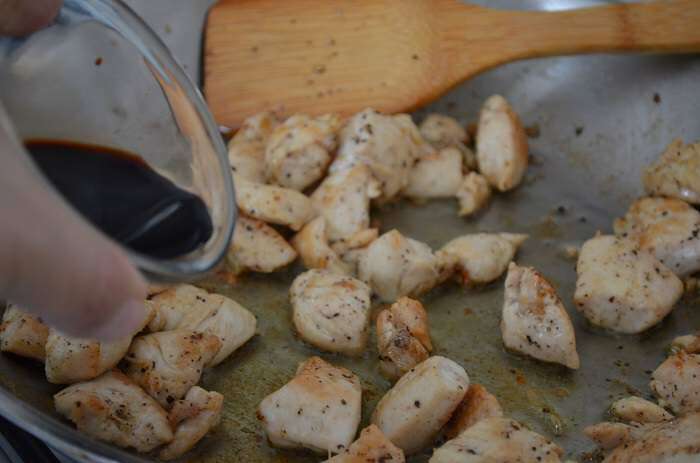 That’s actually good because if you’re not eating this right away, you can store the chicken with this oil and re-heat in it so that it doesn’t dry out. It’ll also give it a bit of a nice sheen. 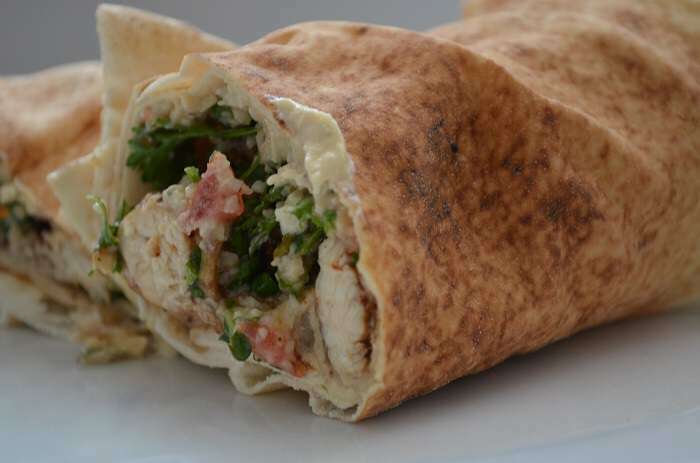 This is not a greasy sandwich, but that extra oil is kind of nice if you want to add in the pita roll. We love it like that. Those bite-size pieces are just wonderful, but you can always cut larger pieces if you prefer. 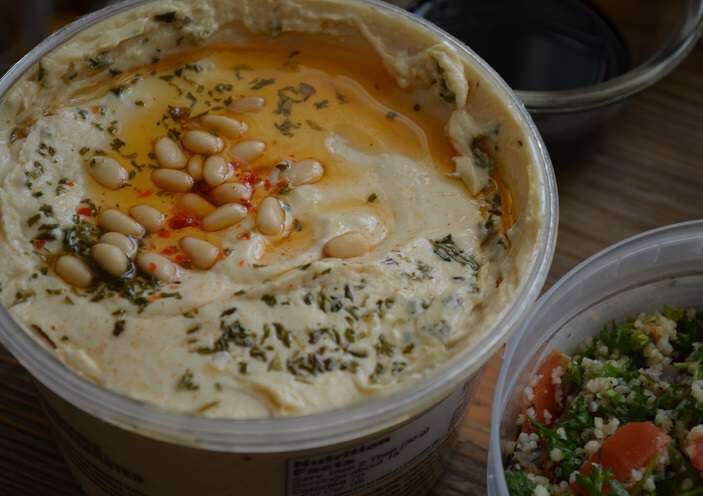 Now get out the hummus. This is a pre-made one, I know. That’s what makes it extra quick when you need things to be fast. 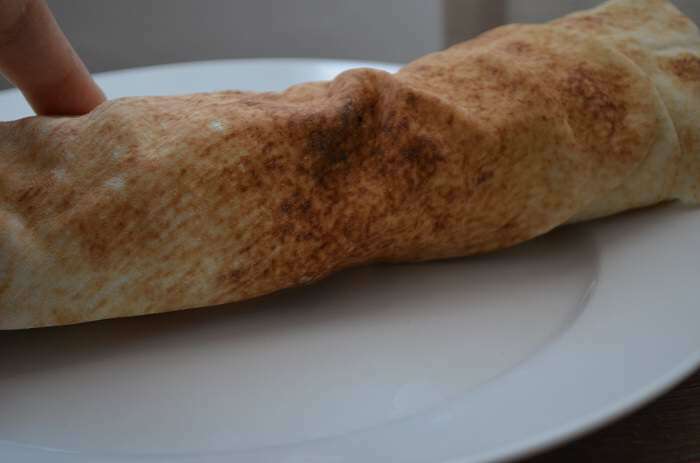 Take a heaping spoonful and spread it across the underside of one whole pita bread laid flat on a plate. Now do one more heaping spoonful. It makes the sandwich more moist. Next is the tabbouleh. Another ready-made version. I said I needed it done fast. But truth be told, I have at times made one thing homemade and store-bought the other. Whatever works for you. 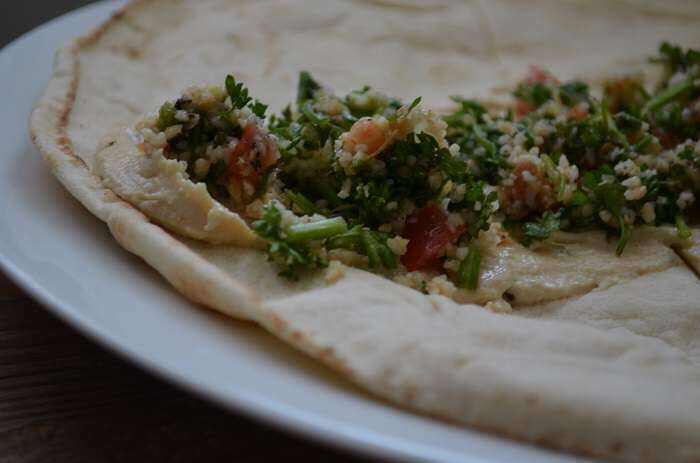 Spread the tabbouleh on top of the hummus. Then, add as much chicken as you’ll like per sandwich. I like to divide the final mixture of chicken into fours so that I know I’ll have four evenly-made sandwiches. Wanna roll? Or eat it open face? Well, you could do either one, really. Let’s say we roll this time. Take one side of the bread and fold it completely over the ingredients lengthwise. Cut them in half, if you like, or just because you want to take photos. Everyone’s doing that these days…. 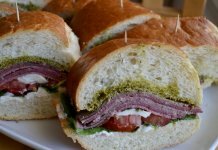 I think we may find one day that there are more pictures of sandwiches and said pita rolls than there are of children in our families. Quick and easy wraps that can be made ahead of time for weekday lunches or a relaxing weekend meal. Light yet filling, too! 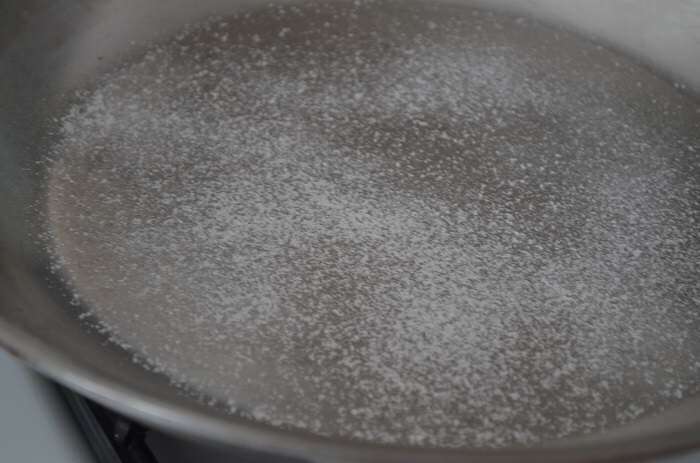 In a large sauté pan, gently heat the oil over low-medium flame then add the salt. Add the chicken and cook for about five minutes over medium heat without turning it. Once browned on the bottom, gently turn each piece. 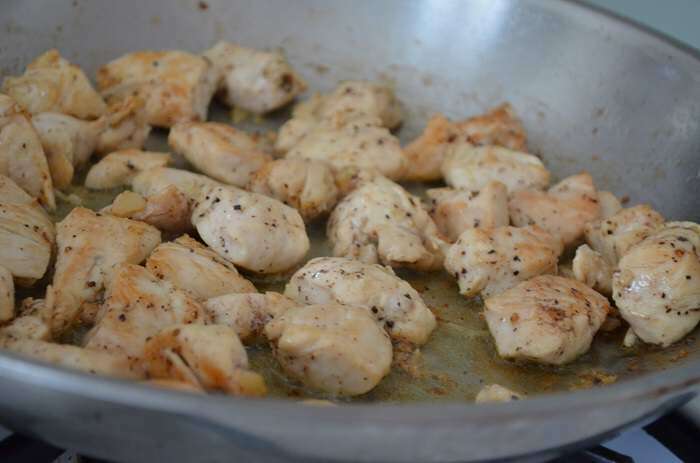 Cook for an additional five minutes, or until the chicken is thoroughly browned. Next, add the vinegar. Let the vinegar bubble a bit then evaporate slightly. De-glaze the pan with a spatula. Toss the meat around so that every piece is touched by the vinegar. 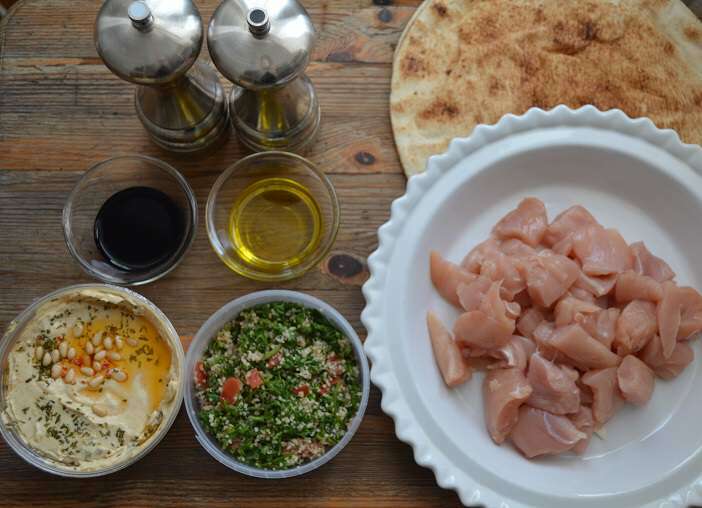 Turn off heat and let the chicken rest and cool slightly before preparing the pita rolls. 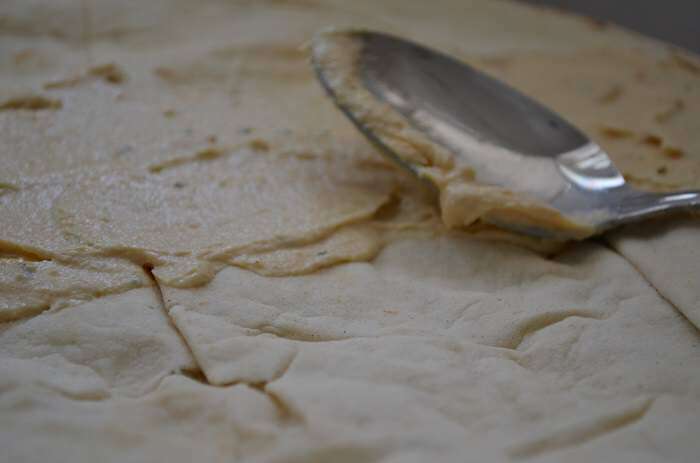 Once cooled, divide it into four equal parts to make the pita rolls. 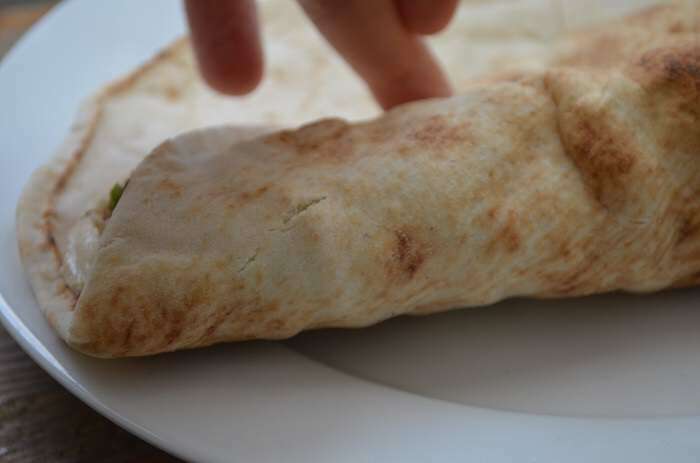 To make the pita rolls, place one piece of bread on a plate with the ‘wrong side’ facing upwards. Spread two heaping tablespoons full of hummus down the middle. Next, do the same with the tabbouleh directly on top. 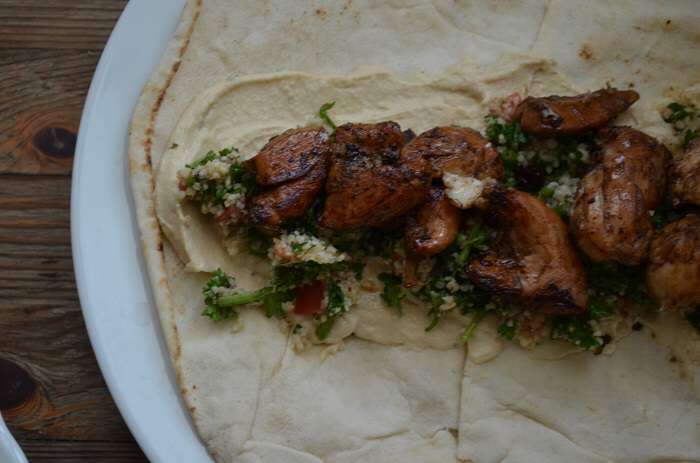 Add 1/4 of the divided chicken to one pita directly on top of the tabbouleh. 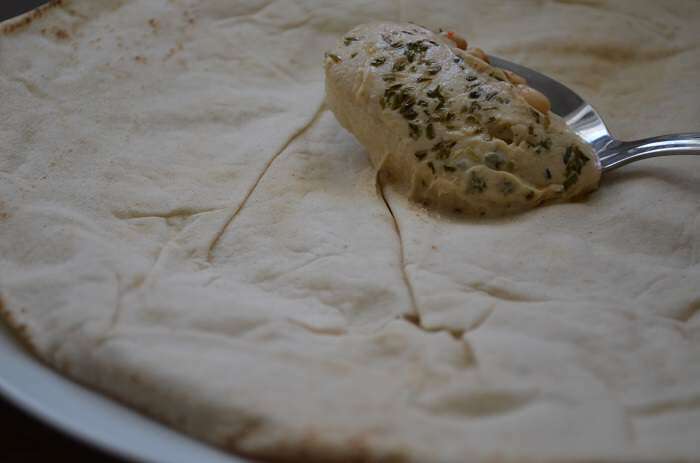 Roll one edge of the pita bread completely over the ingredients then fold in with your hands slightly to keep the contents firmly inside. Roll one more time and secure it closed. Cut in half, if desired. Wrap in parchment paper or foil for your lunchbox. Can’t wait to try some chicken Alfredo with this boneless chicken! 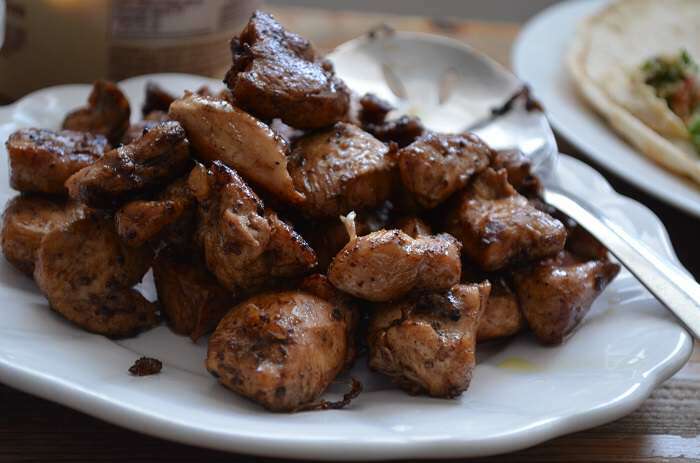 I usually make chicken shawarma with boneless chicken. delish! 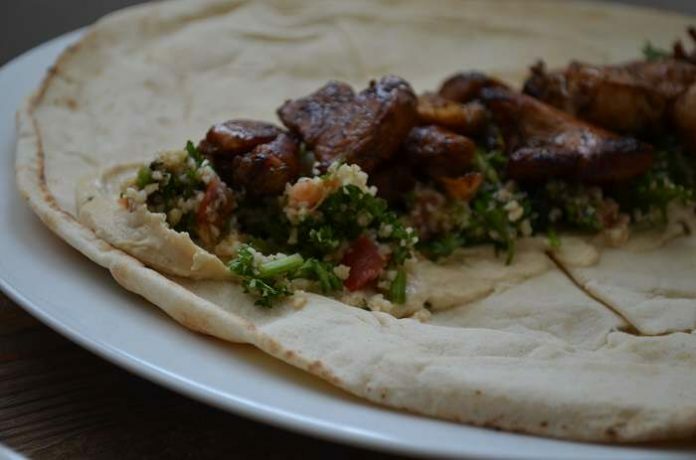 Salaam, with Crescents boneless skinless breast cubes I would love to try this recipe of chicken pita rolls! 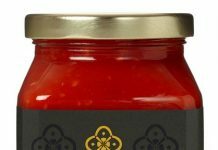 My mouth is salivating as I write this, I cannot wait to try it! I love making battered chicken breast nuggets for the kids but would LOVE to try this recipe!! 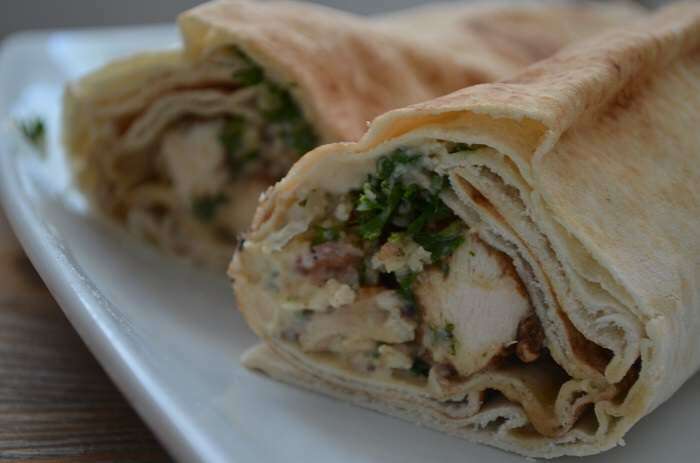 I want to make the Chicken Pita Rolls with Hummus & Tabbouleh of course! 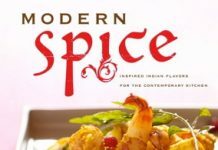 This is such a unique and delish dish. Aoa, i would love to make chicken tikka wirh boneless meat 🙂 its an indian dish and we love to eat it!! 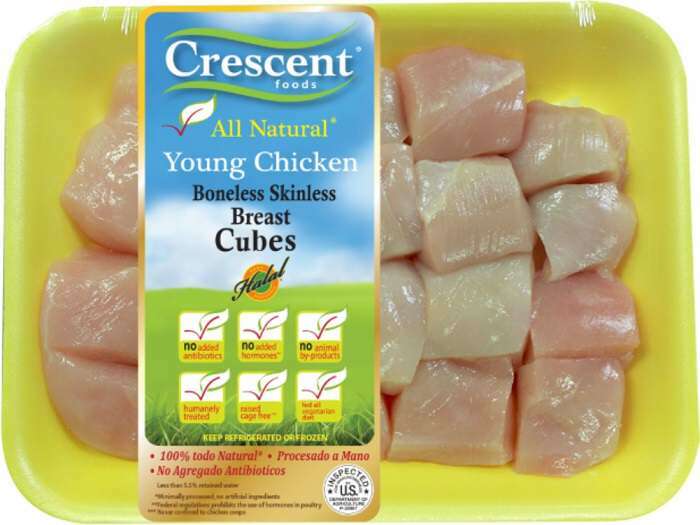 I can’t wait to try Crescent’s new boneless skinless chicken breast cubes as a Parmesan Pepper stir-fry atop romaine lettuce in a wrap inshaAllah! 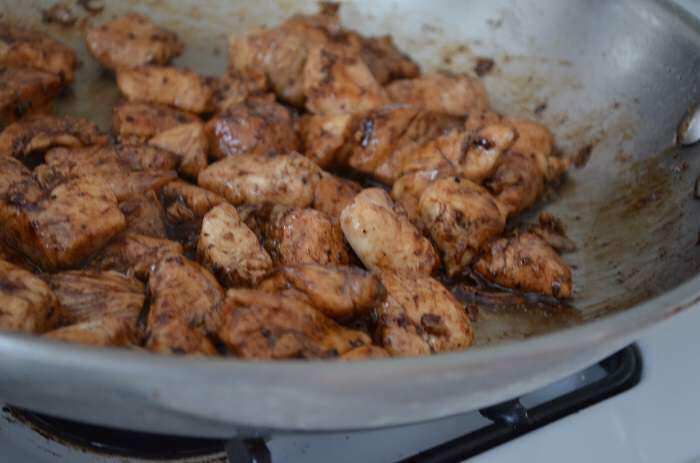 I would like to make chicken tikka masala with the boneless chicken. Yum!! I will try the recipe given above with crescent boneless chicken cubes. 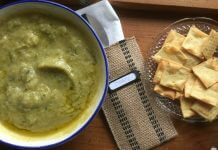 I would like to make wasabi with crescent chicken and would want a recipe too. 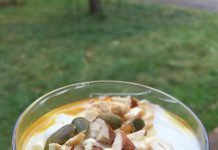 I want to try this recipe that you’ve listed! Looks so yummy!! i really like to make bon less chicken handi with it.Every one loves it. I’d like to make chicken rolls with a creamy yoghurt dressing and some baked potato wedges with just about enough Sriracha! Mmm so good! I will make chicken jalfraizi inshaallah& also chicken boneless tikka with it. I would try these in my chicken and mushroom quesadillas. 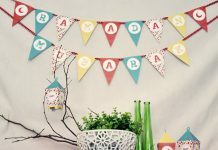 Very nice and very good post for a halal recipe. Mix Crescent’s new boneless skinless breast cubes with red chiili powder,tumeric,Salt,Ginger Garlic Paste,Black pepper,Garam Masala powder,Corn flour and marinate for 1 hour with little water.Keep it in the refrigerator. 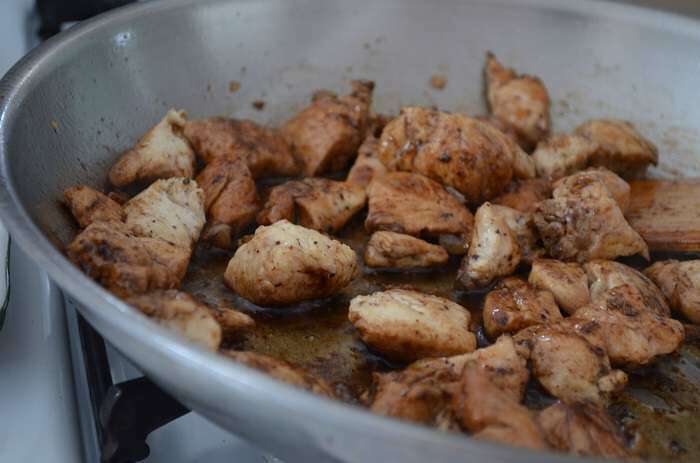 Take a Large Saute pan add oil ,heat the pan on medium heat add the marinated chicken to the pan,allow it to cook till the chicken is done. 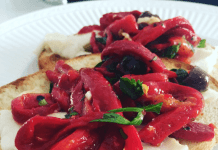 Garnish with green chilles and coriander leaves. 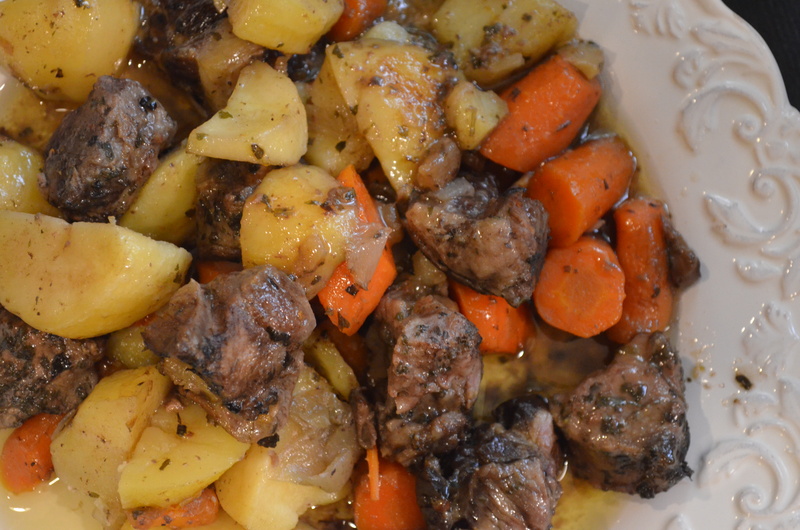 Serve this with pita bread,Roti or par boiled rice. 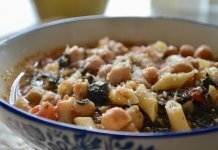 Hope everyone trys this recipe!!! Wow, looks delicious! and I am sure it tastes no less! 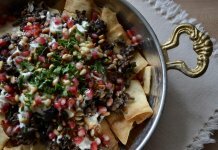 I love Middle Eastern food! I looooove Humus! Will try this one day inshallah. Thank you sister! This chicken is from Crescent Foods (www.crescenthalal.com). MHK is doing wonderful job. Thanks. Thank you for your detailed explanations (I love it) and the pictures. I think I am a BIG fan now. 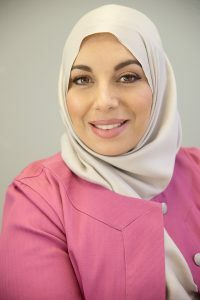 if that is you in the picture, you are gorgeous Mashallah. as I mentioned, I have just found your site, and am grateful.